The dolphins appear to wear a mask, hood and cape that range from dark grey to black in colour. The markings begin at the tip of the nose and extend back past the dorsal fin. The lips, throat and underbelly are in stark contrast with hues of white to pink. The belly surface is further marked with irregular grey or black splotches. The nose or beak is long, round and gently curves to form a small head. The body is stocky in appearance having dorsal and pectoral fins located further back on the body compared to other dolphins. Additionally, the fins are much larger in size. This playful sea mammal was aptly named for the wrinkled ridges on the crowns of the 22 to 27 large teeth within its mouth. They have the capability to stay submerged for as long as 15 minutes at a time and have been seen diving to depths of 70m for food. Like other dolphin species, the rough-tooth dolphins communicate and echolocate with shrill, high-pitched whistles and clicks.Many times the dolphins wear scars from skirmishes with octopi, sharks or other rough-toothed dolphins. 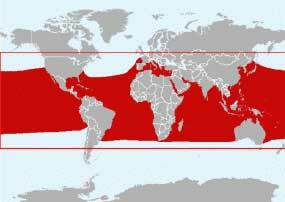 Rough-toothed dolphins prefer deep tropical waters around the world. 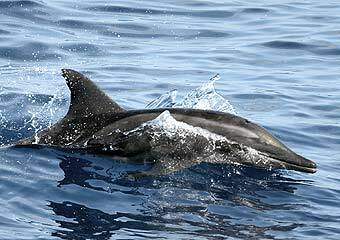 They are very social creatures not only amongst their own kind, but with other dolphin species, some whales and fish. In fact, the rough-tooth has been known to produce hybrid offspring with other dolphin species while in captivity. The rough-toothed dolphin is known to travel in groups as small as 8 and in communities numbering in the hundreds. While travelling in groups, the dolphins are noted for being extremely fast swimmers and have been seen surfing along the top of the water or skimming just below the surface. It is not uncommon for the curious animals to venture close to boats or ride along the bow waves of passing vessels.